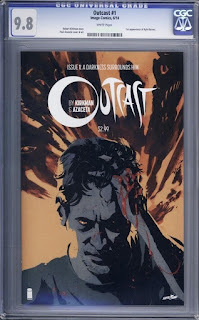 Outcast is a supernatural horror comic from Image Comics, and was created by none other than writer Robert Kirkman, the creator of The Walking Dead, and artist Paul Azaceta. Outcast is yet another Kirkman scripted comic that's headed to the small screen. Season one will premiere on Cinemax on June 3, and because of the upcoming show, Outcast #1 has seen a huge boost in demand. Our tortured hero, Kyle Barnes, has been plagued with demonic possession his whole life. At a young age, his mother, Sarah, became possessed and started beating him. With the help of Reverend Anderson, the demon was exorcised but Sarah was left in a comatose state. Because Kyle's mother was now in a coma, he went into the foster care. The family that took him in were the parents of Megan Holt. With a little persuasion from Megan, they decided to adopt him and raise him as their own son. Megan would eventually become possessed too, but not in this issue. When Kyle got older, he married Allison Barnes. Eventually, like most married couples do, they had a baby, Amber. Can you guess what happens to them? Yup, you guessed it, possessed...both of 'em. This time, Kyle tries to exorcise them without any help from Reverend Anderson. The exorcism worked, but it left Allison with several wounds, making it look like Kyle was a wife beater. She now has a restraining order against him and lives in Charleston with Amber. For some reason, everyone Kyle is close to becomes possessed by demons, now he lives a lonely desolate life to protect his friends and family. There was a lot of hype over this comic before it came out so Image printed a lot of copies. 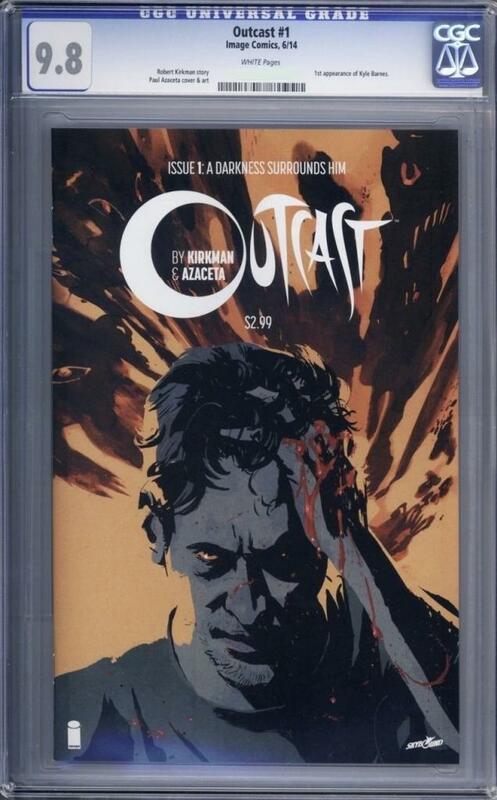 Outcast #1 had an estimated print run of 71,788. It's not like they printed 500,000 or a million copies, but this comic is in no way rare, scarce, or hard to find. In fact it's in the top 15 most printed comics for the month that it was released. However, even with the high print run, it seems that there weren't enough copies in their first printing, because there were 4 more printings after that. In total, Outcast went all the way to a fifth printing. Talk about a huge demand for this book. I don't have any numbers on any of the other printings, but that doesn't really concern me. For this post, I'm only concerned about first print copies. Be aware, many of the covers of printings two through five look exactly like or very similar to the cover of the first print. Be sure to pay attention to which one you're looking at. There are a couple of things that surprised me when I was looking over the CGC census. One was that there weren zero copies graded over a 9.8. For a book this recent, it seems like there should be a few 9.9 copies, maybe even a 10. The other was at just how many 9.8 copies there were. To date, CGC has 3,146 copies in their census. Of those, 2,638 are graded a respectable 9.8. Wowza! Needless to say, there is no shortage of high grade copies of Outcast #1 out there for you to buy if you were looking for one. 9.6 copies are far more scarce than 9.8's. There are only a fraction of 9.6's compared to 9.8 copies. In fact, there are only 375 9.6 copies listed in their census at this time. This comic has seen a lot of action in terms of sales lately, but with so many high grade copies, there hasn't been a dramatic increase in value. According go goCollect, the latest sales for high grade 9.8 copies are just a hair under the $100 mark. If you're looking for a more affordable option, the latest sales for 9.6 copies are currently selling for under $40, but that's probably not a good option considering how many copies are graded higher than that. There are a few sales for copies graded lower that a 9.6, but honestly, the prices are so low, they're not really worth mentioning. With the new T.V. series coming soon, you can probably expect to see values for this comic rise slightly, but don't buy it expecting it to be the next Walking Dead #1. With the amount of copies out there, that's probably not going to happen. But, if you're looking for a short term investment, this could be one to snag and flip it for some quick cash, but only if you act soon.